It makes a lot of sense for electronics firms to pack a variety of functions into mobile devices and expand their usefulness. Instead of confining their use to communications, companies such as Apple, Samsung, and others have turned mobile phones into mini-computers that can serve as a substitute for your laptop, or as a storage device. If you’re using mobile phones as a communications and storage device, backing up now would be a wise move. More than 50% of the world’s adult population use a mobile phone with internet connection, so dangers in these handy devices are to be expected. Scarier than the thought of being offline is being online and exposed to malware. If you use your mobile devices as an extension of your work computers, backing up is a must. Mobile phones have become as vulnerable to malware as laptops and desktops have, especially if you consider the fact that many professionals and business owners use them for emailing confidential documents and storing business-critical files. Other than malware, other types of disasters can happen on your device. Because you carry it wherever your go, your device can easily be stolen, misplaced, or damaged. They may be easily replaceable, but the data contained in them may not. Having completely backed up data on your devices helps prevent a minor inconvenience from turning into a disastrous situation. Performing backups in iPhone and Android devices is a seamless process. Their operating systems require only minimal effort from users, and backing up entails nothing more than logging into their Apple or Google account. However, other users have different devices with different operating systems, slightly complicating the process. 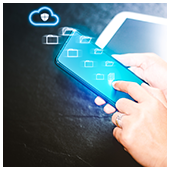 Mobile devices’ safety is essential to business continuity plans. So whether your office users are tied to a single operating system or prefer different devices, there are options to back up all your organization’s mobile devices. There are cloud backup services that enable syncing of all devices and that back up files, contacts, photos, videos, and other critical files in one neat backup system. These mobile backup tools are offered on monthly or lifetime subscription schemes, which provides small businesses with enough flexibility to ensure protection. Mobile phones have become so ubiquitous to how people function that many feel the need to have two or more phones, mostly to have one for personal use and another for business. With all these options on hand, there’s no excuse for not backing up data on your mobile devices. Our experts can provide practical advice on security for your business’s computers and mobile devices. Call us for mobile backup and other security solutions today.